I have been browsing Pinterest lately and I came across something that I saw a few years back. 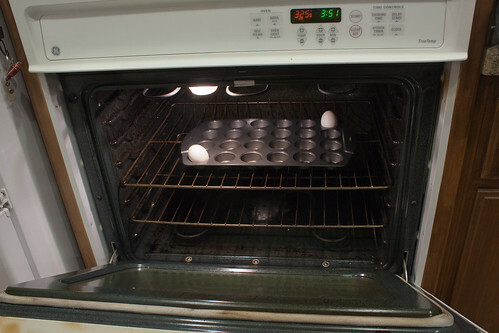 Alton Brown had baked his Easter eggs right on the rack in his oven. He said the peels come off easier and the yolks come out perfectly cooked, every time. Well, I just got around to trying it today and it seems to have worked… sorta. 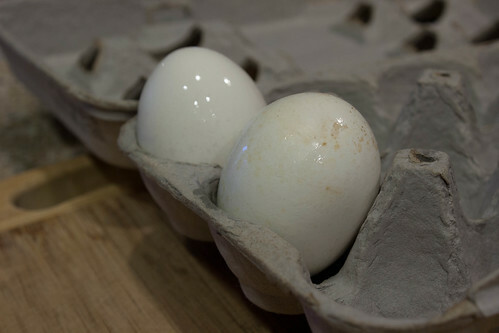 I took 2 eggs from the carton I had in my fridge for the last week and a half. 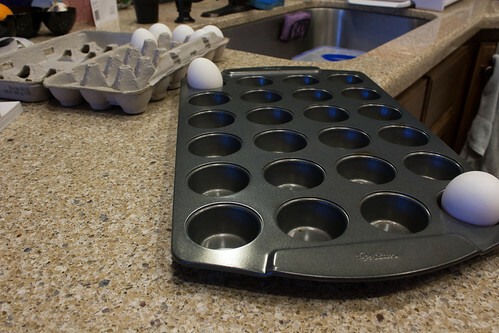 (I bought fresh eggs from the store yesterday but everyone says the peel coming off easily is because the egg is older so I thought I should start there) I pre-heated my oven to 325F and stuck the eggs in a mini muffin pan. 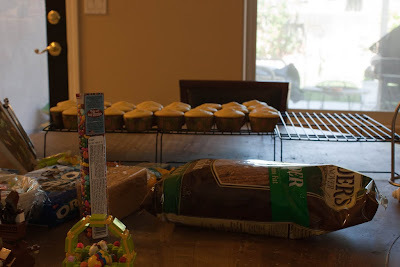 When the oven got to temperature, I put them in and set a timer for 15 minutes. I wanted to make sure they baked evenly so I turned the pan halfway through the cooking time and flipped the eggs over with tongs. Then i set the timer for 15 more minutes. 30 minutes total cooking time. After 30 minutes, they went into a nice icy bath! They bathed for another 20 minutes, til they were cool. One egg was perfect on the outside! It was completely white. 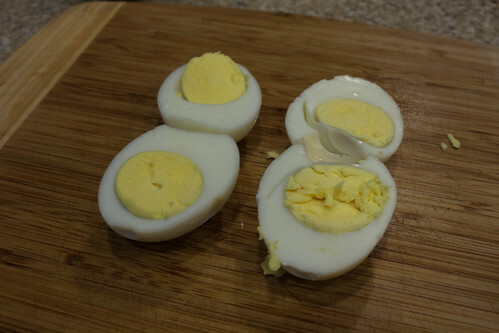 The white egg peeled perfectly. The shell came off in like 2 pieces. 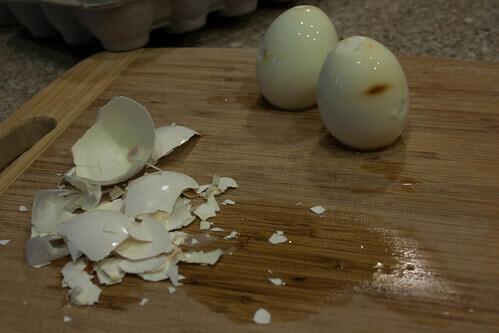 The browned egg, the shell came off in a million tiny pieces and took some of the egg white with it. 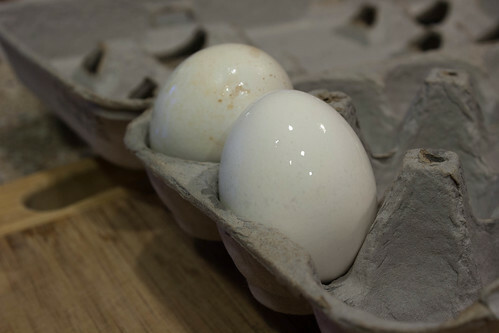 The egg with the big brown spot is also the egg that had the browning on the shell. It tasted normal but it has a weird look for sure. 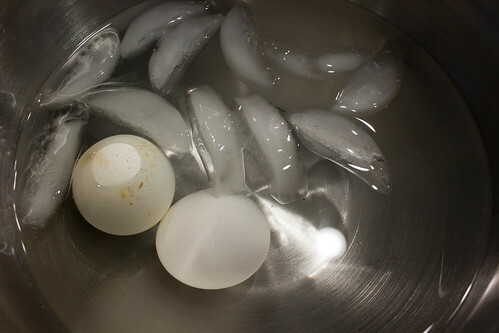 If you are doing deviled eggs, you might want to stick to boiling so the whites stay perfect. 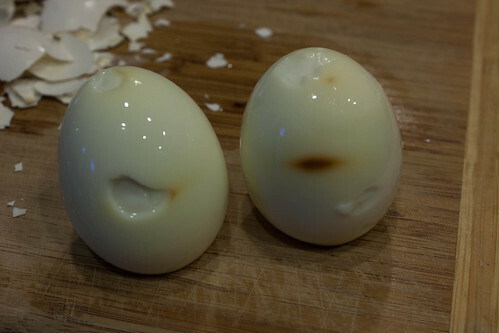 Even the perfect egg had a very little bit of browning on the white. Maybe I need to bake it for less time or at a lower temperature? The best part of this, is that the yolks look PERFECT. I have tried a million times to get the yolk to not have that green/grey line around the outside edge after you boil it. I can’t tell you how many different crazy things I have done to try to minimize it. It might be worth baking them just for the perfect yolks. I offered to make cupcakes for the guys at Halliburton plus the guys out at the rig that Carter is currently working with. I told him to just pick whichever ones he wants out of the books and I will make them tomorrow and Friday for him. Since Friday is his birthday and its kind of sad that he has to work, I figured this would be a nice thing to do for it. I have started gathering my supplies for this endeavor. 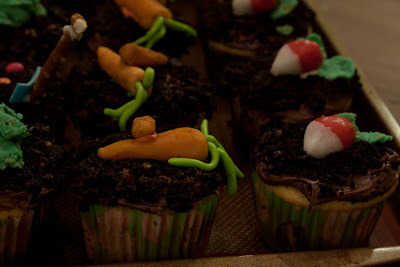 I have never tried to make these fancy cupcakes in two batches before but it can’t be that hard, right?! 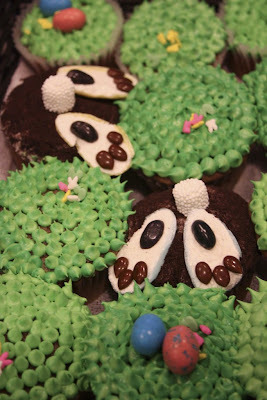 I have made these particular Garden Party cupcakes before but I had Carter’s help with them. I don’t remember them being that hard to make, just that they took a bunch of time. I have set aside the entire day tomorrow (Thursday) to work on them. 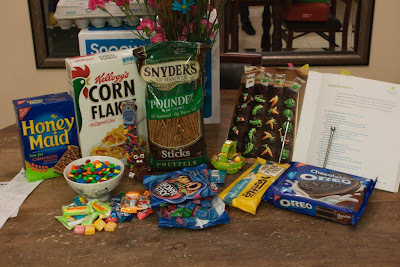 I went to CVS Pharmacy to get most of the candies. They have the best selection by far. Chocolate covered sunflower seeds were found at Cost Plus World Market. 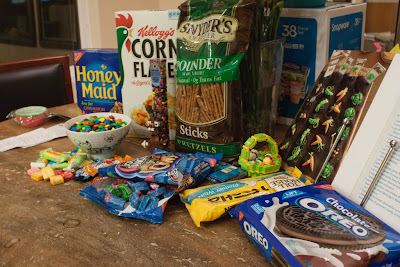 The only thing I couldn’t find today were the Kellogg’s Green Fruit Streamers. I have a sad feeling that they don’t make them anymore. Fresh and Easy had most of what I needed besides the candy. Albertson’s was my last stop for a few odds and ends. Progress update tomorrow! So today I noticed that I didn’t have any white taffy. The AirHeads I had were all colored and I didn’t pick up any mystery flavored ones yesterday while I was out. I figured Albertson’s would have at least the loose ones. I was wrong. I tried RiteAid and CVS as well and no one had any. I bought a bag of Tootsie Rolls that I thought were white but they turned out to not be. I just dipped the red radishes into white chocolate instead and that worked out really well. 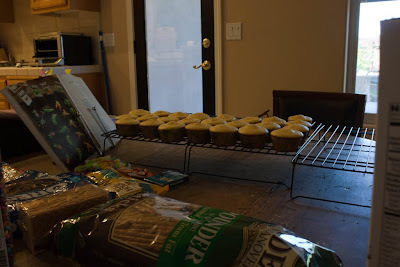 I started getting everything set up and counted out after I baked the cupcakes this afternoon. I doubled the amount of corn flakes the recipe called for. That was not necessary. 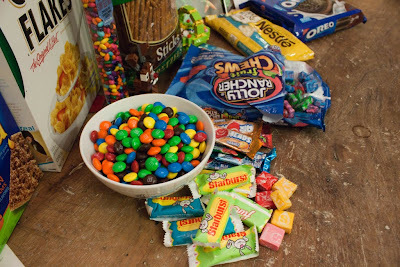 Doubled the amounts of all the candies needed as well. I started with the signs. 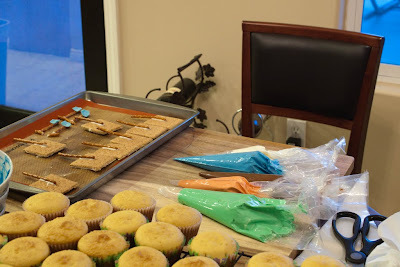 Thats 8 pieces of Cinnamon Graham Crackers for two sets of the cupcakes. 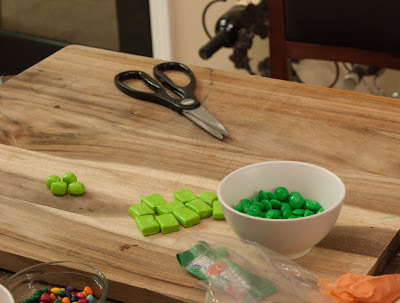 On the side of the cutting board, you can see that I have already shaped the gum pieces to the best of my ability. I don’t recommend using WinterFresh gum because it was very brittle. Something softer is much better. 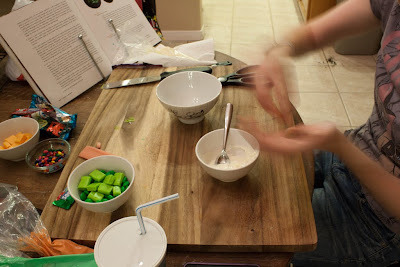 Once the signs were chilling in the fridge, it was time to make the colored frosting and get all the bags ready to go. 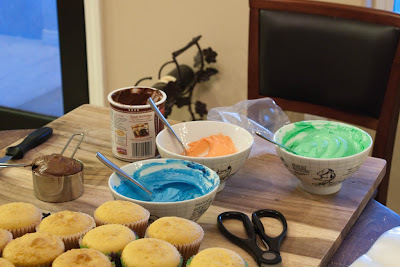 I doubled the recipe for each of the required colors. This was completely unnecessary and I ended up throwing away most of it 😦 The regular recipe makes more than enough to do two sets of the cupcakes. 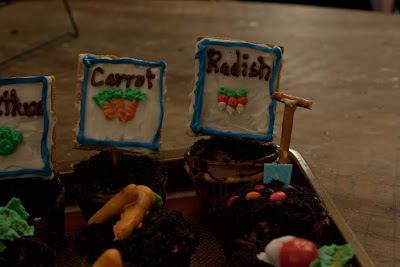 Once the signs are solid, it is time to write/draw on them with frosting. 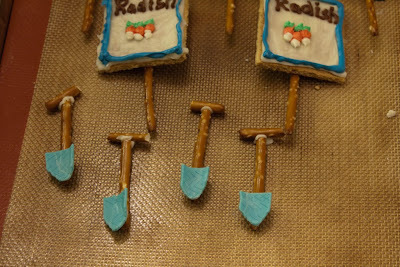 Shovels are done as well! 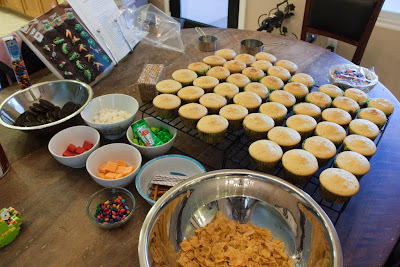 With the signs finished, I worked on frosting the cupcakes. I used Double Stuf Chocolate Creme Oreos for the topping. 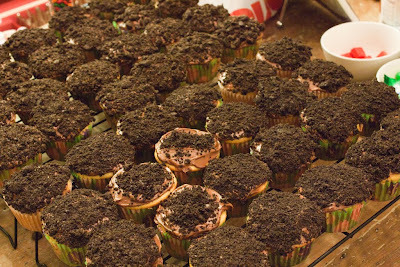 I used pretty much the entire bag for all 48 cupcakes. I think next time I will stick with the Famous Chocolate Wafer cookies. 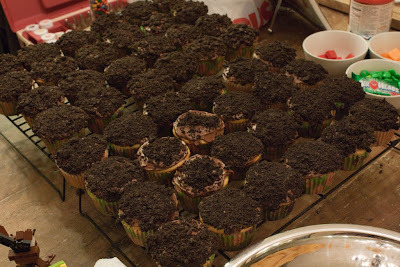 The creme filling in the Oreos was a little messier than I would have liked but of course, they taste better. 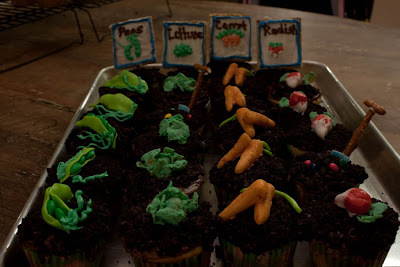 The lettuce was an interesting project. 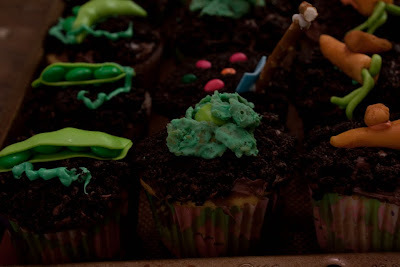 I wanted to use the green frosting in the bag after I made the lettuce. I decided to just take some out of the top of the bag. 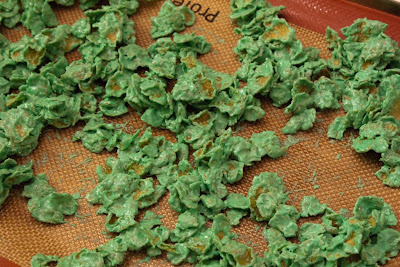 Next time, I will definitely remember to leave some green out of the bag to melt and pour over the corn flakes. This was another portion of the instructions that just didn’t need to be doubled. I had way too much leftover. 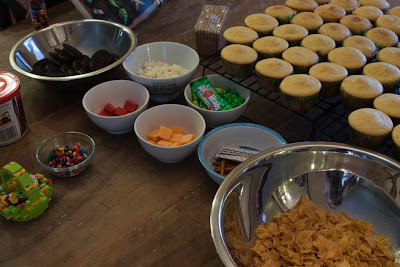 After I cleaned up a bit, I started working with the candies. 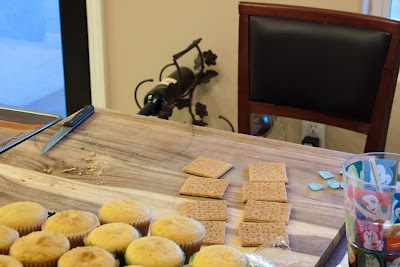 Unfortunately, there were cookie crumbs everywhere, even though I wiped everything down. 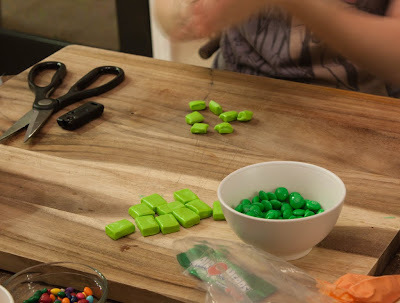 I just went with it because by this time I had been working for 2.5 hours already and hadn’t started the hardest part yet 😛 I used the good green candy (Jolly Rancher Chews) for the lettuce centers at first. 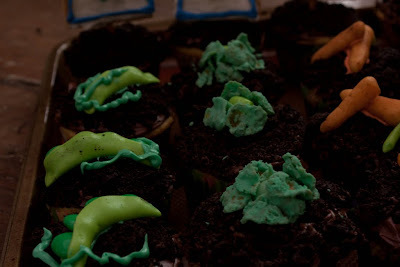 Later I traded them out for Green AirHeads because the Jolly Rancher Chews look much better as the pea pods. 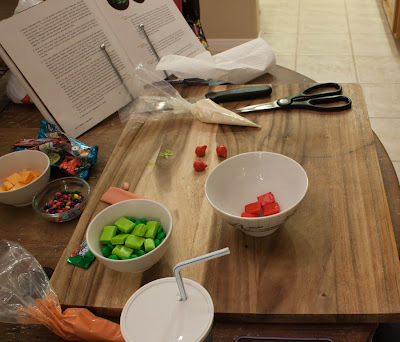 The bowl at the top right of the cutting board was used to heat the Jolly Rancher Chews for 10 seconds at a time in the microwave to make them easier to mold. My hands were super sore after this and I highly recommend keeping the candies warm to keep them soft. 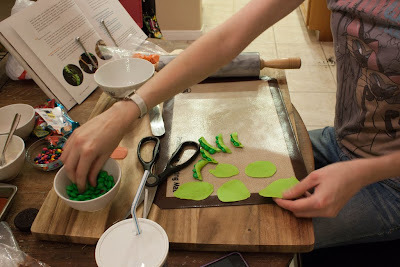 Also, use a silpat or parchment paper so they don’t stick to whatever you are rolling them on. Starting on the red radishes. As I said earlier, I didn’t have any white candy to work with so white chocolate was the answer. 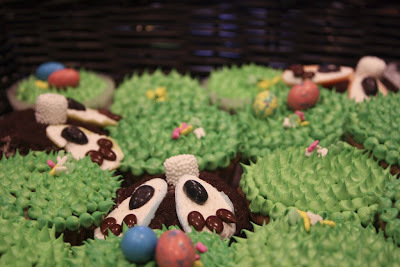 I think they still came out awesome. 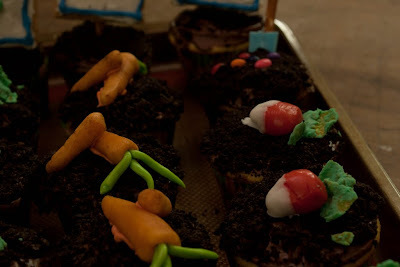 Working on carrots. I think the orange AirHeads were easier to work with than the orange Starbursts. Both look good though. 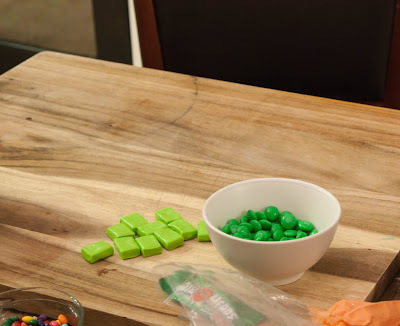 The recipe is easier to follow if you use the Starbursts because that is what they recommend. 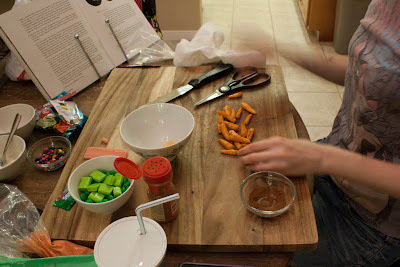 Once I shaped the small and large carrots, I coated them in cinnamon to make them look dirty. 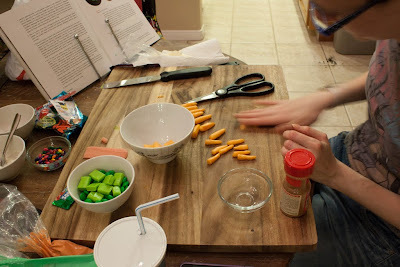 I used a pair of kitchen shears to cut some of the green chews into strips for the tops of the carrots. Once I got enough, I rolled them to make them smooth. 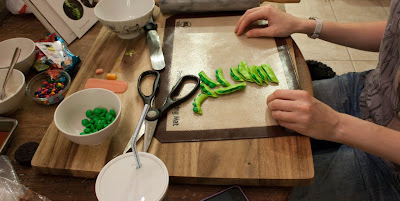 The last of the green chews went to make pea pods. 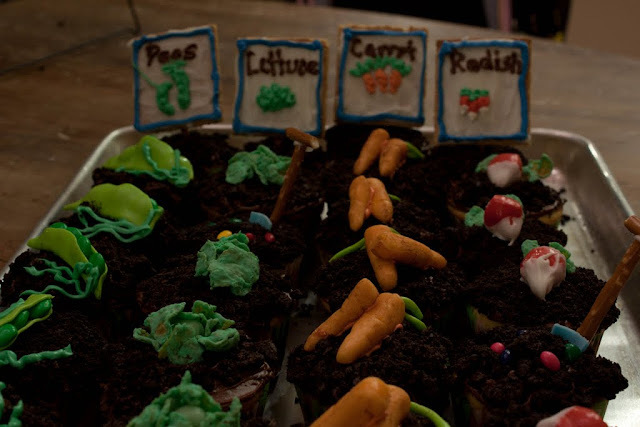 These are probably my favorite of all the candy vegetables because they are so darn cute! Completed. 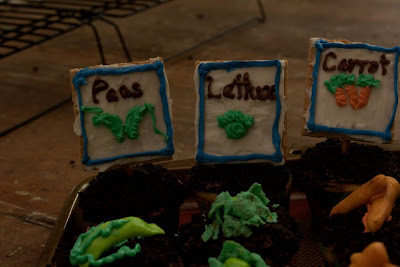 I am hoping to have them in baskets tomorrow but if I can’t find it, the cookie sheets will have to do! I enjoyed making these but they were a lot more work than I remembered them being. 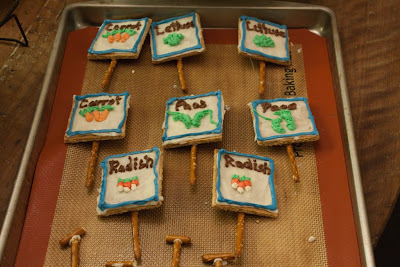 I think the key to something like this is to have someone helping you shape the candies into veggies. That is the most time consuming and also the most difficult part. It is also the most rewarding when people see them 😀 They are definitely worth the time and effort that you put into them 😀 I will add everyone’s reactions to this post tomorrow! 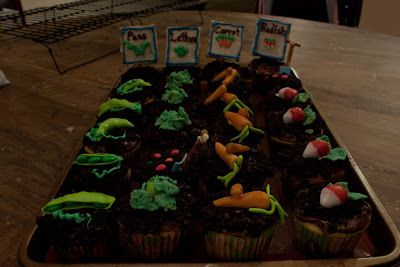 Posted by galadriel07 on April 20, 2011 in The Bakery! Carter and I made Easter Bunnies today!! They are adorable. 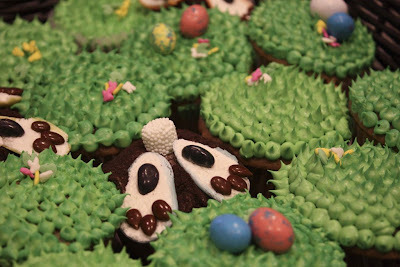 Made of carrot cake with cream cheese frosting, some robin eggs, jelly beans, Easter Basket Eggs, and chocolate covered sunflower seeds. 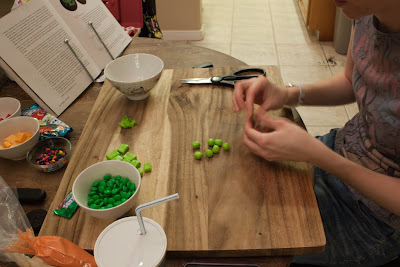 We were supposed to use White Circus Peanuts for the feet but we could only find orange here. 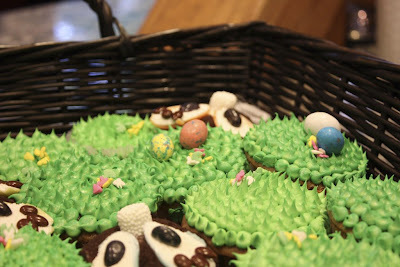 We decided to use the easter basket eggs and boy, was that hard to do. In the end, they came out adorable tho. 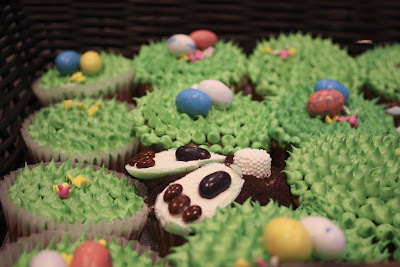 We haven’t eaten any yet but they are sure to be delicious! 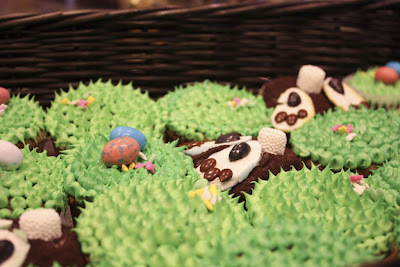 Posted by galadriel07 on April 11, 2009 in The Bakery!